If women will be part of the Shas and United Torah Judaism party lists, most ultra-Orthodox women will not vote for them - this is the argument haredi parties are using to explain the absence of women from their tickets which has been cited as grounds to disqualify them from the elections. They are also claiming that in the ultra-Orthodox community, segregation between men and women exists for "modesty purposes" and not out of discrimination. Each of the genders has a different "role" to play, they say. Women's groups recently submitted a request to the Central Elections Committee to disqualify Shas and the United Torah Judaism for their exclusion of women. Deliberations will be held on Wednesday. Simultaneous deliberations will also be held on bids to disqualify the Arab parties, Knesset Member Hanin Zoabi and the right-wing party, Otzma LeYisrael. Shas and United Torah Judaism wrote in response: "The parties function, as demanded by the halacha (Jewish law), with clear segregation between men and women for reasons of modesty. Men have one role and women have another. This segregation does not exclude women, discriminate against them nor deem them less worthy than men." The response revealed what stands at the base of their platforms. "Could it be that in a democratic government, a party that wants to abide by the halacha is not worthy or can't be elected to Knesset?" "Isn't a claim like this clearly anti-democratic?" Ironically, Shas and the United Torah Judaism added that they don't deny women their right to vote, just not through them. "The respondents abide by the halacha and that is why its representatives are men," they added. "If this approach is unacceptable, you are invited not to vote for the respondents." 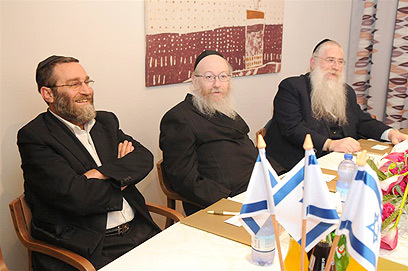 Shas and United Torah Judaism representatives also claimed that ultra-Orthodox females won't vote for them if there are women on the party lists. "Most of the women voting for the respondents will refuse to vote if there will be women on the party list, and that is against halachic law," they added. "In order to satisfy the petitioners' hunger, do we have to prevent the right of many women who want to vote for the respondent parties that do abide by the halacha?" The appeal to disqualify the haredi parties was submitted by various women's organizations and Jerusalem city council member, Laura Wharton. The appeal states that currently "the sad situation of women's under-representation in the Knesset, is imminent," and that, "an absurd situation has been created in which the country subsidizes bodies that discriminate against women." It is estimated within the committee, that it is unlikely that the ultra-Orthodox parties will be disqualified. See all talkbacks "Haredi parties: Women have different role"